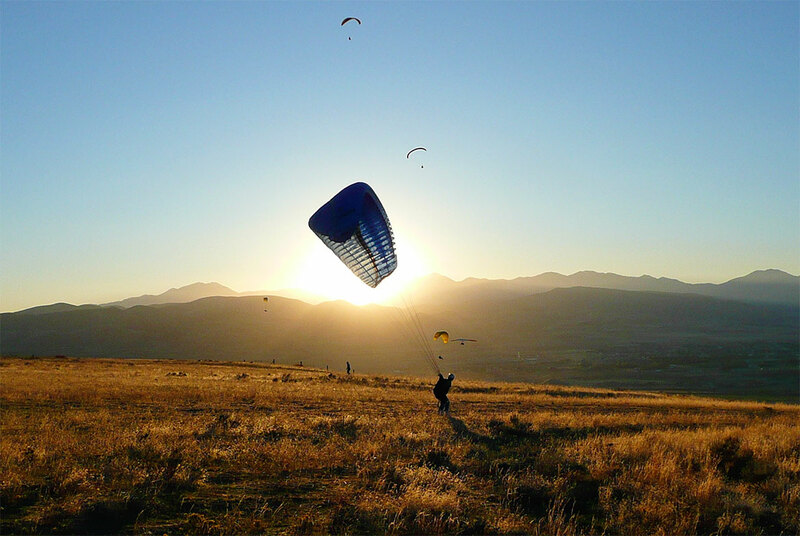 Paragliding and nature are completely connected and in order to become an experienced paraglide pilot, it is necessary to listen, feel and understand the language of nature. Towards the end of the 1940’s in the US, Dr. Francis Rogallo, an American aeronautical engineer and inventor born in Sanger, California was performing experiments with a kite made from plain fabric, which eventually led to radical changes in the construction of lighter aircraft’s and was the predecessor of the modern paraglide. Paragliding in Montenegro is a truly once in a lifetime experience providing a unique view of the country’s breathtaking landscape. Four paragliding clubs are organizing paragliding events on Montenegrin coast for those who love extreme sports. For the tourists who have never flown before and would like to, a tandem flight is around 60 euros, and for friends of the clubs and those who book the flight in advance the price is around 40 euros. Non commercial tandem flying is only permitted for qualified pilots. Buljarica, 640 meters above sea level. GPS coordinates : take off : 42°12’13” (42.2037)N; 18°59’35” (18.9932)E. Elevation landing : 42°11’39” (42.1944)N; 18°57’53” (18.9649)E. Weather hazards : Beware of strong sea breezes. You will not feel them on take off! Vrsuta, 1173 meters above sea level. take off : 42°9’11” (42.1533)N; 19°5’8″ (19.0858)E. Elevation landing : 42°8’22” (42.1397)N; 19°1’35” (19.0266)E – Elevation : 23 m. Weather hazards : Do not fly in any kind of strong wind. Brajici, 760 meters above sea level. take off : 42°18’6″ (42.3019)N; 18°53’29” (18.8914)E. Elevation landing : 42°16’54” (42.2818)N; 18°52’23” (18.8732)E Weather hazards : Strong katabatic wind called Bora.It is so strong that no one would think of flying. Dizdarica, 882 meters above sea level. take off : 42°29’13” (42.487)N; 18°34’6″ (18.5684)E. Elevation landing : 42°27’29” (42.4582)N; 18°34’39” (18.5777)E – Elevation : 5 m. Weather hazards : Typical Mediterranean weather conditions. No special warnings. South wind components are best for flying hire. Jejavica, 939 meters above sea level. take off : 42°52’20” (42.8724)N; 19°53’31” (19.892)E. Elevation landing : 42°51’56” (42.8656)N; 19°53’22” (19.8896)E – Elevation : 673 m. Konjsko, 1468 meters above sea level. take off : 42°49’49” (42.8304)N; 19°47’2″ (19.7841)E. Elevation landing : 42°49’56” (42.8323)N; 19°51’33” (19.8592)E – Elevation : 650 m. Strane, 954 meters above sea level. take off : 42°51’50” (42.8641)N; 19°51’18” (19.8552)E. Elevation landing : 42°51’13” (42.8538)N; 19°51’45” (19.8626)E – Elevation : 692 m.
Bukvica, 1534 meters above sea level. take off : 42°58’55” (42.9822)N; 20°0’7″ (20.0022)E. Elevation landing : 42°55’45” (42.9292)N; 19°58’3″ (19.9676)E – Elevation : 893 m.
Krnovo, 1821 meters above sea level. take off : 42°52’53” (42.8816)N; 19°8’41” (19.1448)E. Elevation landing : 42°53’7″ (42.8854)N; 19°7’5″ (19.1181)E – Elevation : 1493 m. Weather hazards : Wind is always cca 2m/s stronger compared to forecast. Mojkovac, 1601 m meters above sea level. take off : 42°56’57” (42.9493)N; 19°30’38” (19.5108)E. Elevation landing : 42°57’23” (42.9564)N; 19°34’48” (19.5802)E – Elevation : 800 m.
Momcilov grad, 1737 m meters above sea level. Savin Kuk, 2305 meters above sea level. take off : 43°7’21” (43.1226)N; 19°4’52” (19.0812)E. Elevation landing : 43°7’22” (43.123)N; 19°6’16” (19.1045)E – Elevation : 1506 m. Stuoc, 2036 m. meters above sea level. take off : 43°11’18” (43.1885)N; 19°3’24” (19.0567)E. Elevation landing : 43°12’50” (43.2141)N; 19°4’46” (19.0795)E – Elevation : 661 m. Weather hazards : It is wide, but it is still a canyon.